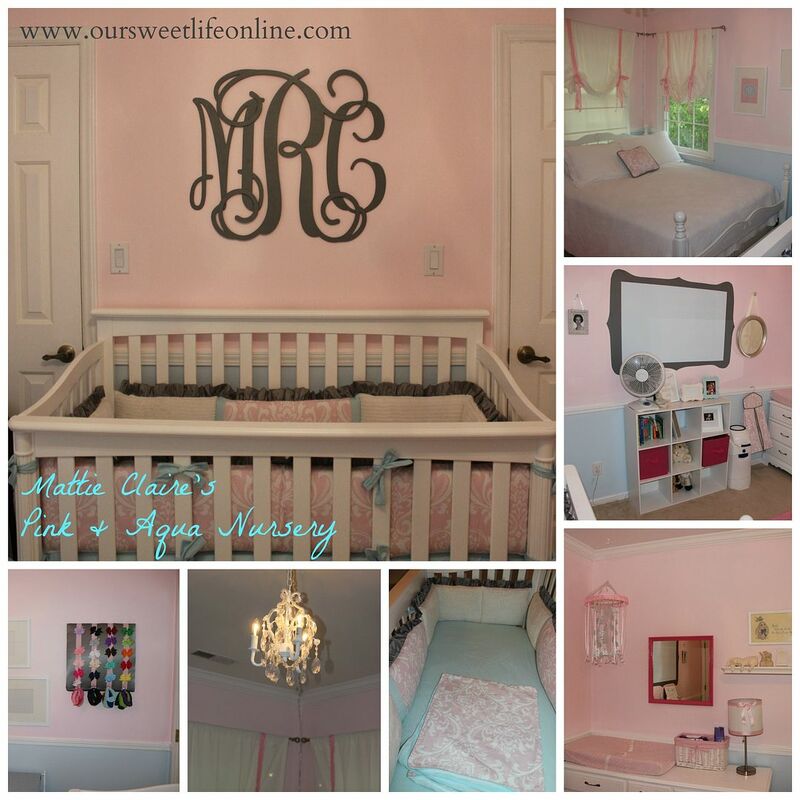 So maybe because this is more than likely the last baby nursery I will get to design or because it is even more likely that it is the one and only girl nursery I will get to design, I had so many ideas for this room. I knew I wanted to work with a lot of what we already had (crib, dresser, big bed, and other basics that were already in the room from Brody's nursery). 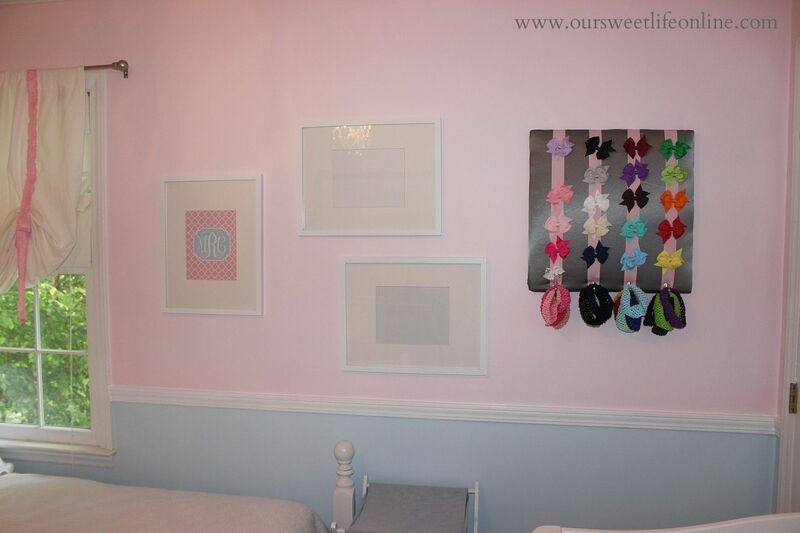 I had loved the way light blue and light pink looked together for a while, and the color scheme worked well since the room was already primarily blue. I learned that with a girl's room, it is truly amazing what you can transform with some pretty ribbon and a hot glue gun. I love that we made many of the projects ourselves because they seem so much more unique and special. 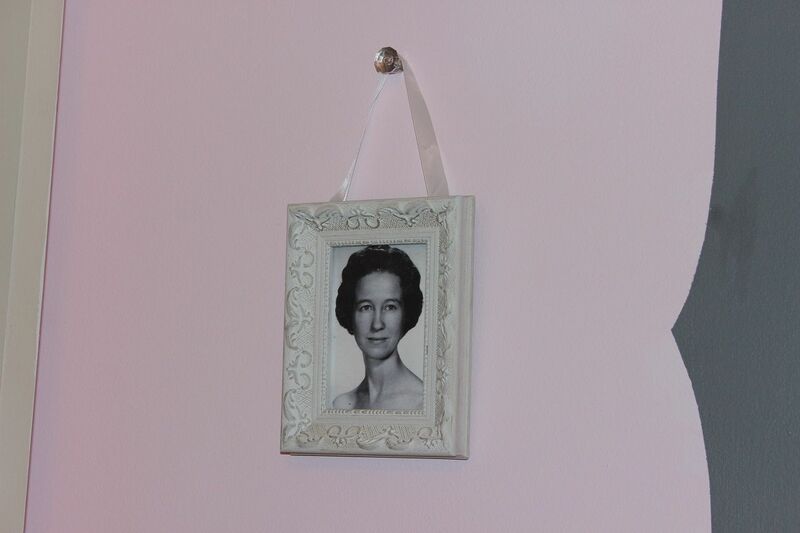 The room also seems to be a special tribute to Mattie's namesake, her great-grandmother, who loved things very feminine. 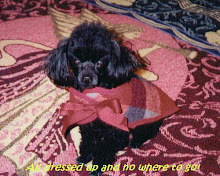 When she was very sick and had to spend all of her time in her bed at home, she had her own room decorated to her taste. The room at my husband's grandfather's house still sits much as she left it about 15 years ago complete with the books she loved to read and all the journals she hand wrote. 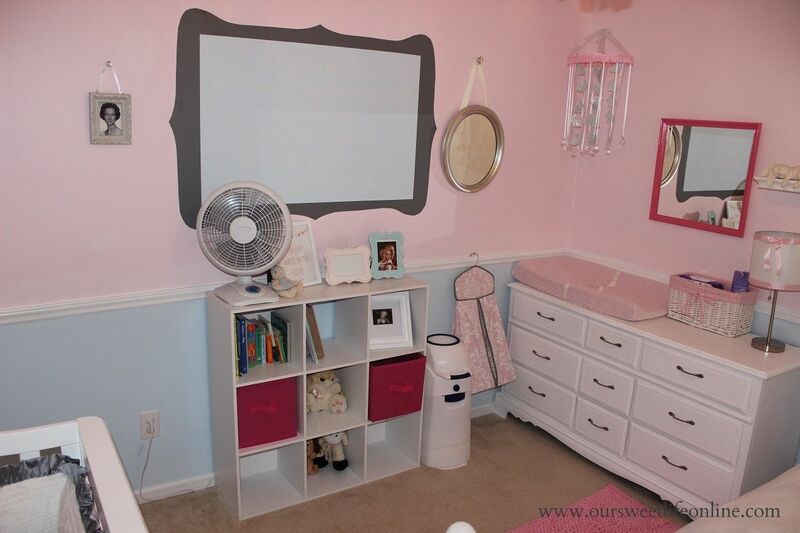 I hope that she would like little Mattie's room as well. Mattie's crib was left from Brody's nursery. It was the only piece of furniture we had to purchase for his room, and we didn't purchase any new furniture for Mattie's room. 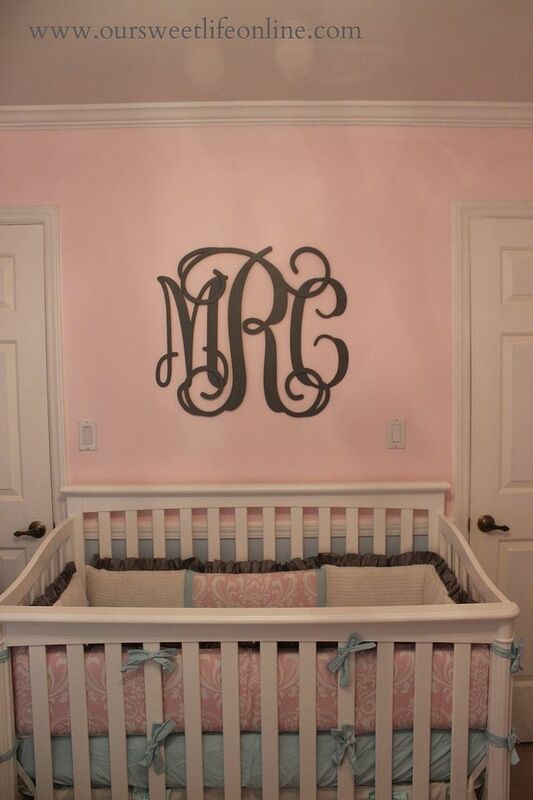 The wood carved monogram over her crib is from the Etsy shop Trendy Trimmings, the same store that made the monogram for our bedroom. She and her husband do awesome quality work and are wonderful to work with. 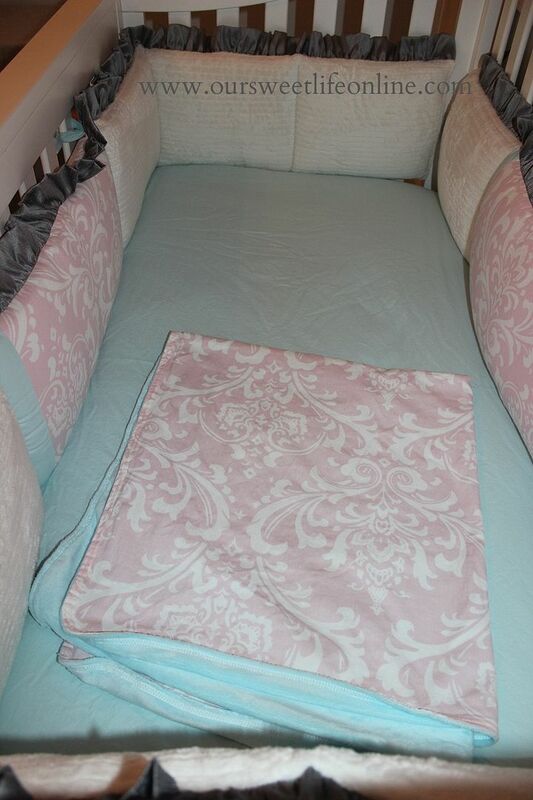 I had searched and searched for pink and aqua crib bedding that I loved but didn't fall in love with any (most was too dark for what I wanted) until I came across this set from Carousel Designs. It is called Ritzy Baby. I love that this company makes everything in the USA because I had grown frustrated with companies like Pottery Barn importing all of their products from overseas. This company has been around for over 25 years, and the quality of the bedding is wonderful. 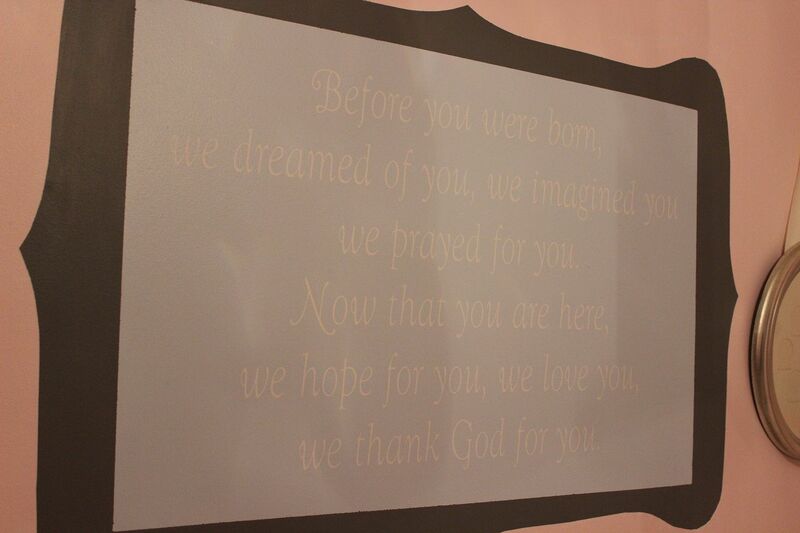 This vinyl decal was one that we purchased for Brody's nursery, and we loved it so much and didn't want to take it down. We decided to try to paint around it and make it look like a framed piece of art in the room. I hand drew the stenciled "frame" and Eddie was very patient painting it. This side of the room seems to have a lot going on, but it doesn't feel that busy when you are in the space. 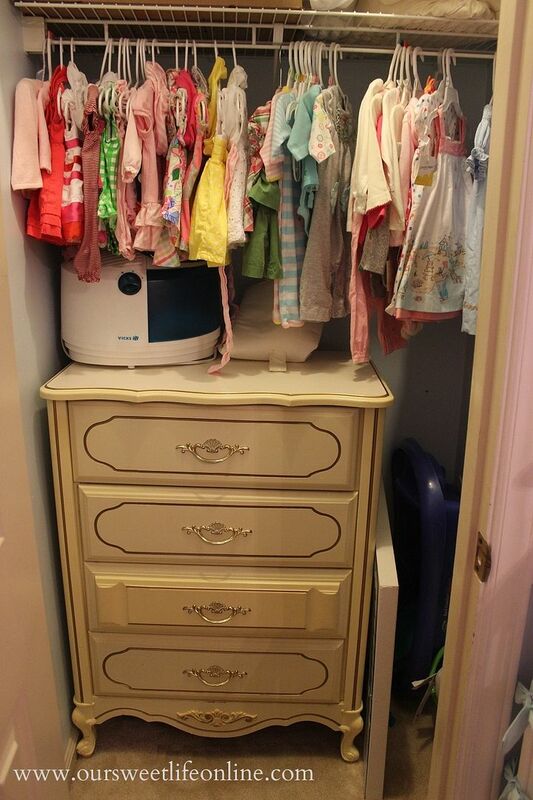 Another view of the dresser/changing station in the room. We'll look more closely at some of the special items here. 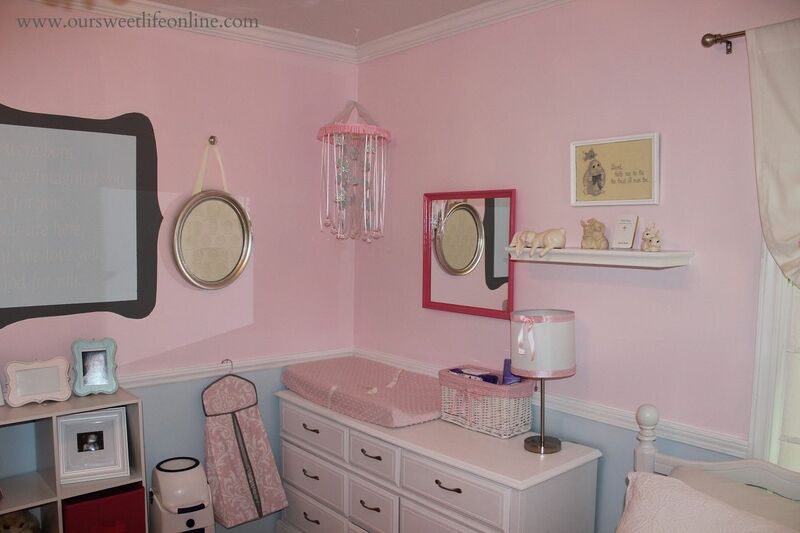 I didn't want to spend a bunch of money for a new mirror above the dresser, but I just thought the plain white framed mirror that was in Brody's nursery didn't have any feminine flair to it. We thought spray painting it a darker glossy pink color would really give it some wow. 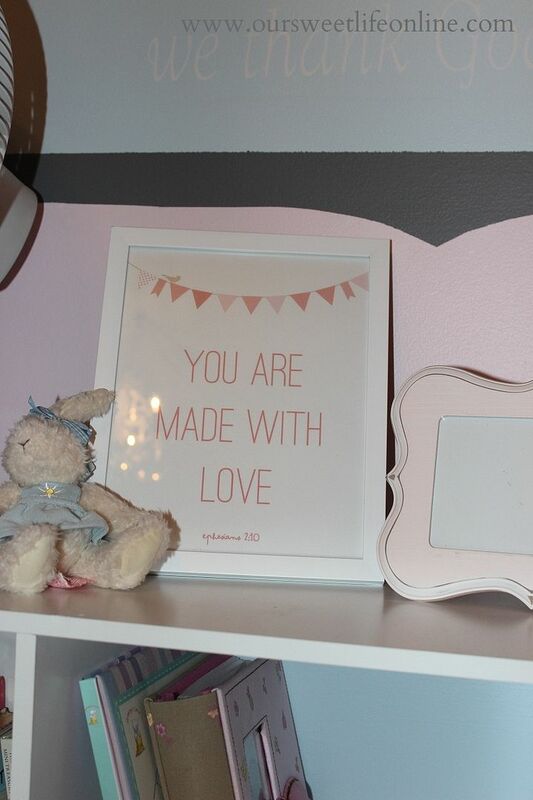 The Pottery Barn Kids 1st Year Frame has been a must have for all of our kids' rooms. I had the silver one in Brody's room, but I decided to buy him a new white one to match his brother's and keep the silver one for Mattie. This handmade mobile was Mommy's own idea and handiwork. 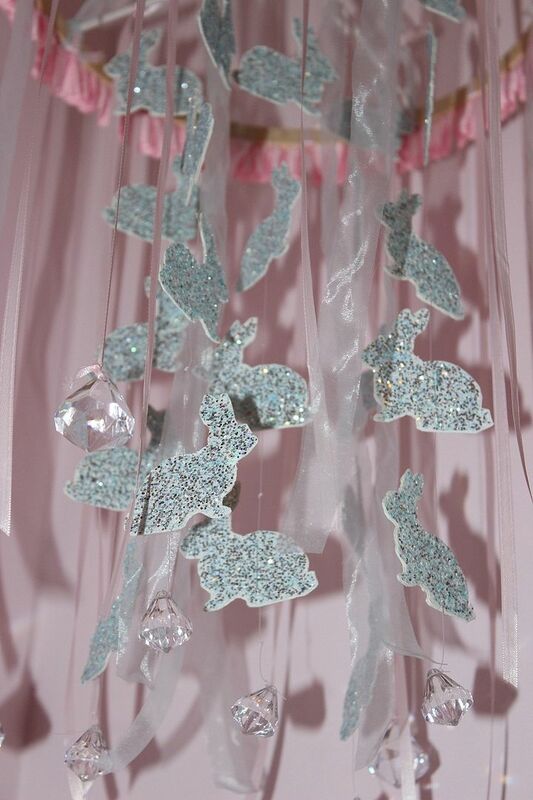 I knew I wanted to incorporate some bunnies into the room, and I also loved the diamond/crystal like drops that just added a touch any girl can appreciate. I didn't have any luck finding bunnies already cut out so of course I had to cut each one out by hand. I loved this glittery blue card stock paper I found at Michael's and decided to use it, but it was only one-sided so that meant having to make the bunnies double sided. That meant I hand cut about 48 little bunnies...a labor of love! This was a very special little spot for Mommy. She enjoyed going through her old childhood bunny collection and picking out some special pieces for Mattie. 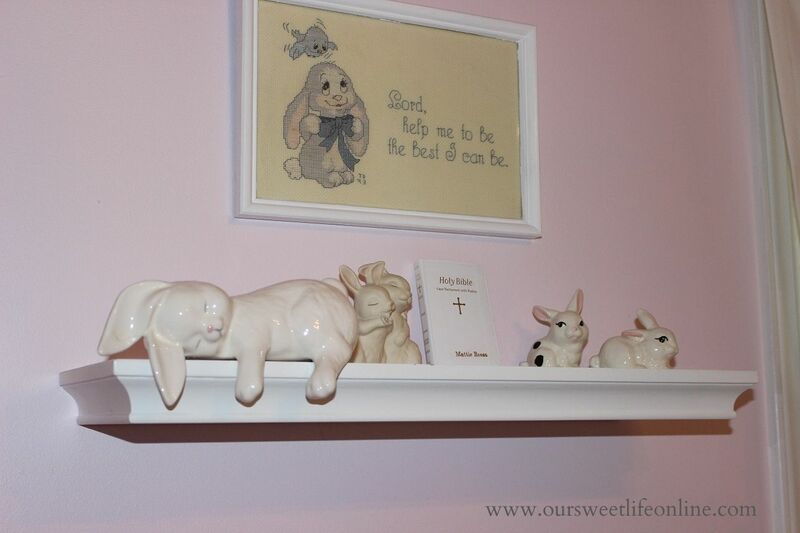 The little framed cross stitched art just has such a sweet prayer, and I just love these sweet little porcelain bunnies. Mattie's great-aunt already sent her a little Bible with her name on it. 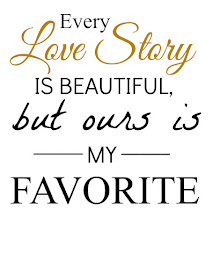 This sweet little printable art is made by my sweet blog friend, Tamara at Two Four Five Designs. Please check out her Etsy shop to see more of her inspiring creations. 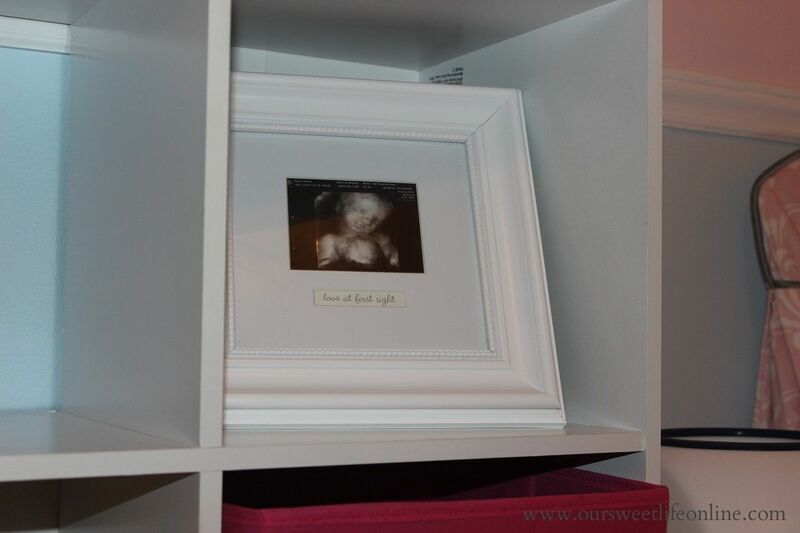 Got to have that sweet ultrasound picture on display. 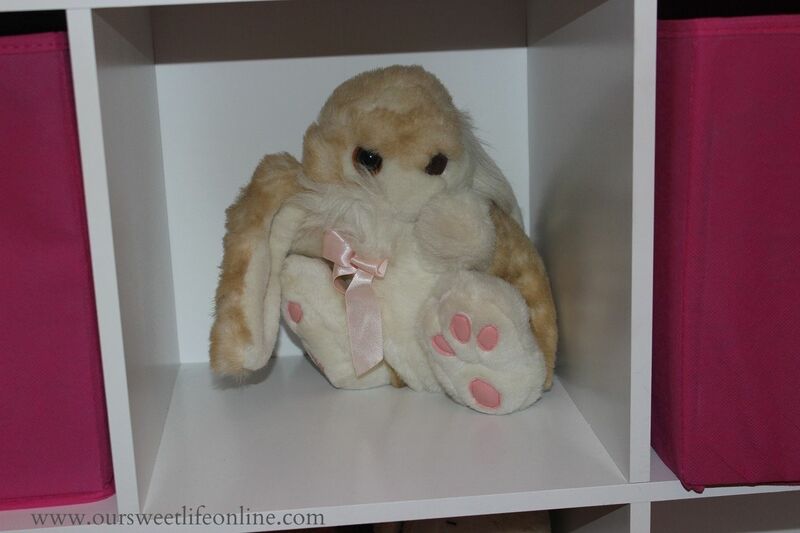 Another special addition is this soft little stuffed bunny that was my favorite in my collection. Who wouldn't love this adorable bunny with the softest fur, big bunny feet, and the sweetest little pink bow? Mattie's bow holder was a special handmade project that Daddy and big brother worked on. I am especially loving the way the gray accents in the room really came together to match the dark gray trim on the bedding. The frames will hopefully soon display some sweet pictures of the room's owner. 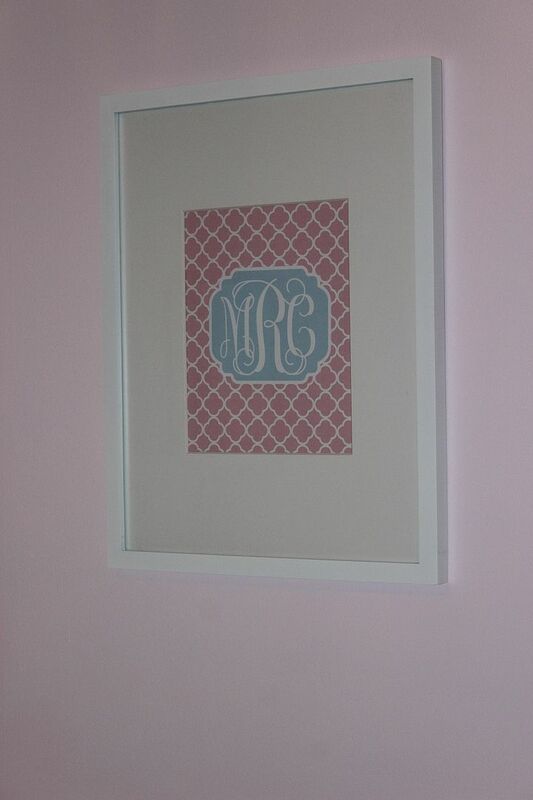 I loved this little free printable monogram online that just matched the nursery colors perfectly. The really surprising thing about this and the wooden monogram is that they are the exact same monogram font...right down to every last little curl. They came from different places so it was just neat to see that they were a perfect match. 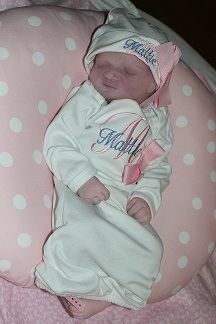 A special picture of Baby Mattie's namesake on display. And every girl needs a well stocked closet, right? Most of these are just for the first few months of her life, and the drawers are filled with onesies, sleepers, gowns, and more. This dresser was also Mommy's as a child, and she didn't want to refinish it so it fits perfectly inside the closet. Thanks, Tamara! Yes, I loved putting in all the little details that just made it feel like a completely different room even though nothing substantial really changed from Brody's room. 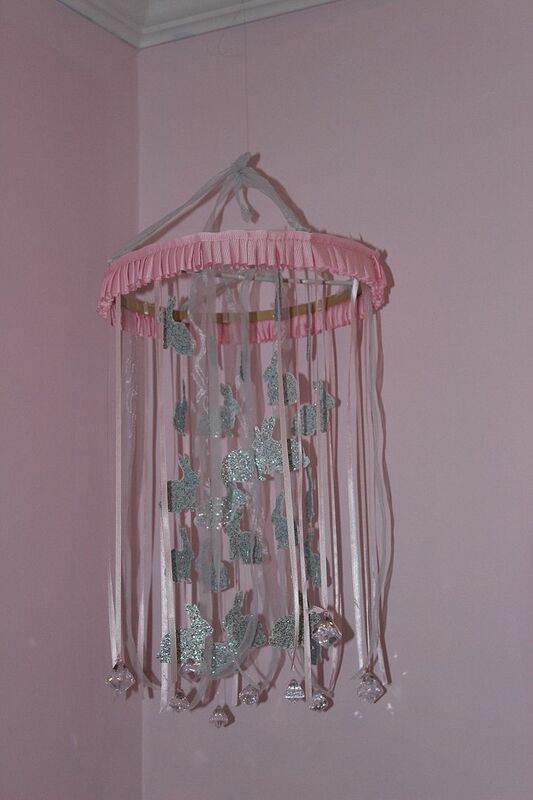 I think my favorite parts are the curtains (just added pretty pink ribbon instead of the plain white they were), the little lamp (again just added the ribbon detail), and the bow holder and mobile that just made it unique and special. 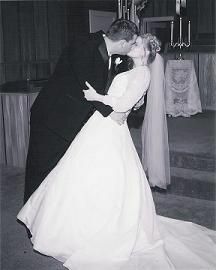 Absolutely beautiful and so much like Mattie's Mommy. Beautiful!!!! You all did an awesome job!!! Thank you, Tracy! It was pretty fun changing the room over to a girly space. I LOVE it! You all did a fabulous job! I love the color scheme! Thanks, Lauren. It was pretty fun to do all the little special projects. This is such a sweet nursery Sherry! I love all the little details. And I CANNOT believe you made all those bunnies for the mobile by hand. What a labour of love for Mattie. And I love her middle name -- it's beautiful. I know, I am a little obsessive about bunnies, but I have waited a while. I guess I could have put bunnies in one of the boys' rooms, but I don't think Eddie would have let me. It is just perfect. Feminine and girly, but not overboard. All of the little details are there and it fits together so well. Love the picture of her namesake! Thank you, Celia! Just need to get her here now!